Painting your exterior involves an extensive undertaking. Why? Your exterior paint and stain protects your exterior surfaces, and it is the first impression your house makes. Each house needs to be assessed correctly in order to prepare the exterior surfaces, use the right products and find the right colour scheme that will suit not just the house itself, but the street it is a part of. Regardless if you are painting your exterior yourself or hiring a professional, here is an overview of the steps to ensure your paint job is done well and gets you the best results. If you are repainting your house, you need to take stock of the current state of your exterior paint. I would not recommend painting over the last paint job without knowing and testing the existing paint. Note: If you are hiring a painter you should supervise their approach to your painting job, as some painters will cut corners in order to save themselves time, which will be costly for you in the long run. To test your exterior paint, purchase a lead testing kit, utility knife and tape from your local Guthrie Bowron store. With the utility knife make a X mark on your weatherboard and cover with tape. 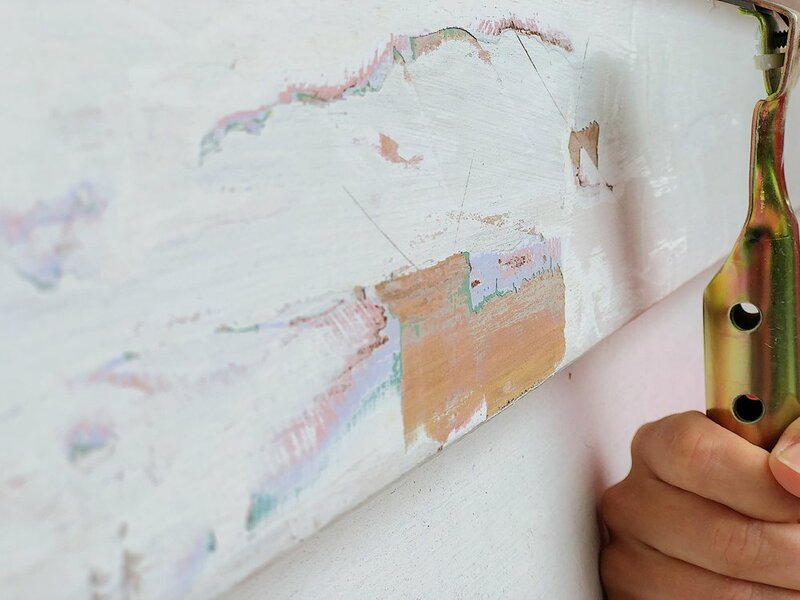 Remove the tape off the weatherboard, if the tape removes paint, it indicates that your paint will need a lot more preparation time. Follow the instructions of your lead testing kit and test the X mark, on the results you will know if lead is found. Make sure you test every side of your house, as finding lead in one area doesn’t mean your whole house has been painted with lead paint. Once you understand the state of your current exterior surface, then you can get the best advice on what how to move to the next element, the preparation. It is said that 90% of painting is the preparation. - If you have new weatherboards, your preparation is quite simple, you will need to fill and sand any holes or gaps, clean the surface and then you are ready to paint. - If you are repainting over lead paint, for your own safety and the safety of others make sure you remove the lead paint correctly. All the guidelines are available here. Once lead is removed, use a recommended primer on the whole exterior. - If your existing paint did not pass the tape test, you will need make sure you invest time in the preparation. Give your exterior a good clean using Dulux Prep Wash, and once dry scrape off the flaky paint and sand it back. Fill in any holes and gaps. Finally you are ready to prime the surface - talk to the experts at Guthrie Bowron about what primer is best for your surface. - If you are repainting a house that is in a good condition, Clean using Dulux Prep Wash and then fill any holes or gaps. Roughly measure the exterior of your house, then the team at Guthrie Bowron will be able to calculate how much DULUX Weathershield X10 or Berger Solarscreen® you require. They can also advise what products to use for your windows, doors, deck and detailings. Ensure that you have all the tools required: paint stirrer, paint bucket, drop sheets, masking tape, quality paint brushes, ladder or trestles, turpentine and painters rags. Begin at the top and work your way down. Paint the underside of your boards then the face. Use long strokes in horizontal motions from one side to the other. Be aware of the impact weather will have on your exterior paint job, too much heat or moisture both impact the quality of your paint job. Keep an eye on the weather report and aim to paint on cloudy warm days. Unless you have a full team of painters, you can’t paint your whole house in a weekend. 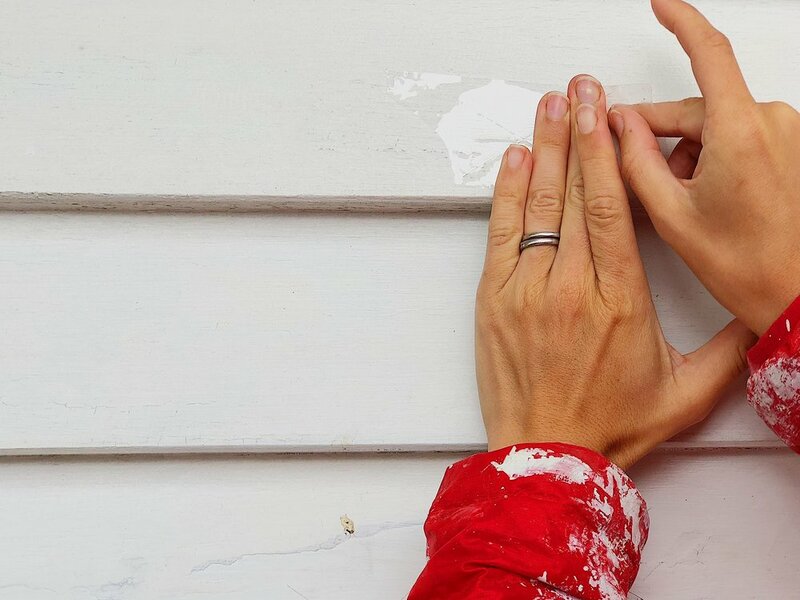 Prep and paint one side of the house at a time and don’t rush the process. Posted on January 23, 2018 by Alice Pearson and filed under Outside Project and tagged painting exterior sanding paint.